A few months ago we saw a post by onlyinyourstate.com about a dinosaur park in Henderson, LA called Prehistoric Park. This attraction has a dinosaur trail with life-like statues of dinosaurs; it’s basically a young boy’s dream. When we found out that our Godson’s 2nd birthday party theme was going to be “Two-rannosurus Rex” dinosaur themed, we knew exactly where he needed to have his 2 year old birthday photoshoot. Getting there seemed like we were going to the middle of nowhere. We were a little skeptical, but when we saw the “Danger: High Voltage” signs we knew we were in the right place and that we were going to enjoy this experience. It’s more than just a trail with dinosaurs. There’s a covered playground area that’s very well kept. There’s also a good sized green space that’s nicely kept. The trail was gorgeous and clean (the only downfall was the amount of mosquitoes). It was filled with dinosaur sounds reminiscent of the Jurassic Park movies, and at the very end, right before the gift shop, is a room of moving and roaring dinosaurs that was creepily life-like. Prehistoric Park is right down the road from an RV Campground and right next to a go-kart track so you could make a whole weekend trip out of this. Now back to our story. Surprisingly our Godchild, Ezra, was very alarmed by the dinosaurs. He was very fascinated and excited, but he didn’t want to get near them at all…not what we had expected. 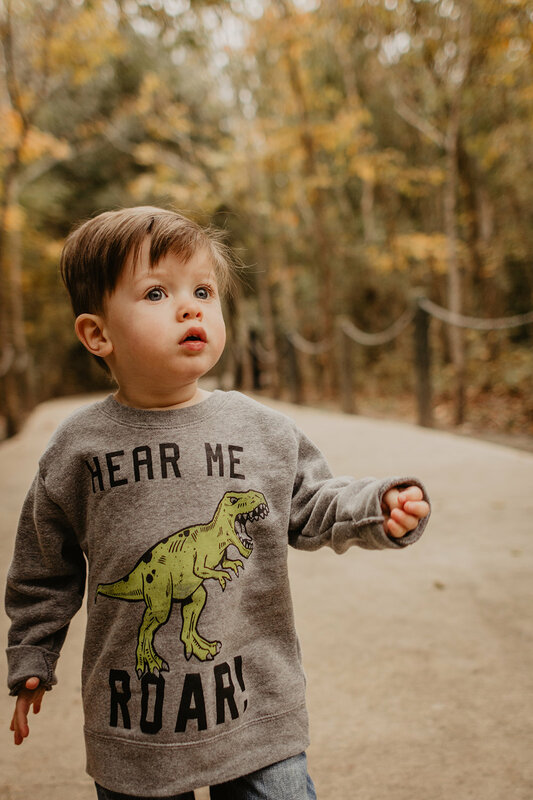 After a little while he warmed up, though, and he and our son, Declan, ended up having a really fun time filled with awe and wonder, and we got to capture these amazing two year old (almost) photos of Ezra.